It is mocking me. It is on my back porch rotting away and it never even had a name or a face. We just gutted the insides and cooked them for our pleasure. A little salt makes them quite tasty. Sure we intended to use the whole thing. We didn’t want to be wasteful of the sunlight and nutrients and sacrifice that was made. The knife was wet from sawing at the top of the head and all that was needed was a few more cuts. We promised to bring it to life with a knife. It would be our Monster and we were the family of Frankensteins. If only we had the time and the patience. Or Teri Garr from Young Frankenstein… Crap I am off track. Focus. Focus. Oh yeah, if only we had the time or the patience. “In a minute” gave way to “bath time”. Then “bedtime” pushed the face-e-otomy to “tomorrow”. We forgot that tomorrow was mommy and daddy date night and the next day was dance and a dinner. Two days later and we pulled off the top of his severed head. Inside looked like the slimy mid-face of my youngest child. Booger-y and something you don’t really want to mess with. He ended up on the back porch. A metaphor for my Halloween intentions. Dead like the flowers that needed to go in the garden. While the faceless Jack judges me through the window I see the perfect parents on Facebook. They have a pumpkin with some extravagant MC Escher inspired landscape where the pumpkin thickness is shaved precisely to cast different light intensity. A brilliant Pinterest work of art. Thanks a lot guys. I try not to have a heart attack watching Supermom cut the top off the pumpkin. She is using a foot long knife, cutting towards herself, and pumpkin is hard to cut until suddenly it isn’t. After about forty five seconds of saying “hey” or “you might wanna”, she glares and me and holds out the knife and thereby her opinion. No need it two of us getting cut so I shut my mouth. At this point the children are uncomfortable and don’t want to watch us cut two triangles and a square, much less witness a stabbing. To all you parents who failed at anything close to cool with the pumpkin this year. This one is for you. You’re welcome. ← Mind If I Join You? Ours also was without a face this yr. Funny how that happens with kids! If it makes you feel any better, we didn’t even bother to buy a pumpkin this year. The Rock and I fail at parenting multiple times daily. And we apparently like to see how long we can torture ourselves with our failures. Part of last year’s nativity scene is still sitting on the piano and old Halloween decorations that are at least 4 years old are still stuck to the windows. Oh yeah, then there’s that “Pebbles is 5 years old! !” banner I made and never got around to taking down. She’s 8. We have had this experience ourselves. This year i bought the cheap little carving set. The one that look’s like a Joke !! Well it was easy enough 2 momma’s and 6 kids Survived with awesome fun pumpkin’s All in about 1hr not bad and the youngest girl of 10 was able to do her’s alone, Family time is most Important. I see your lil pony family had a blast! I love your input and adventures. Keep up the great work. 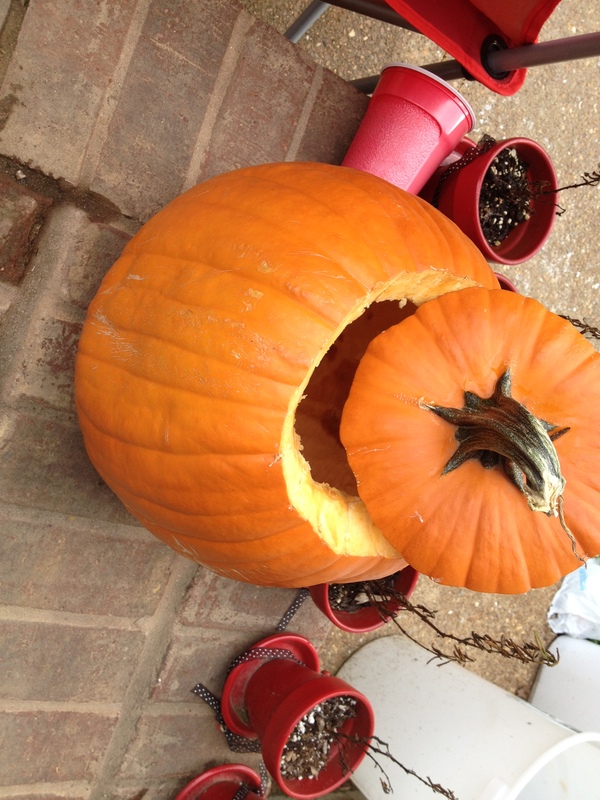 Thanks, don’t worry we are determined to overdo the pumpkin next year! Yeah it’s the yelling and madness that bring us closer together. Glad to hear from you!